To the end of his life, Gordon Stoker fervently defended Elvis Presley. His was a lonely voice, at times, as many of those close to Elvis chose to focus on bizarre details of his personal life. 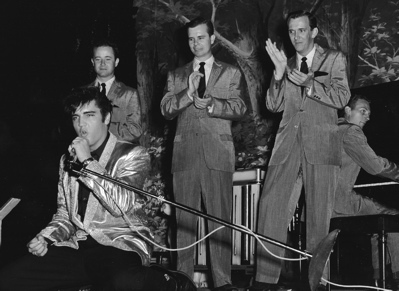 As the leader of The Jordanaires, Elvis’s vocal backing group on stage in 1956-57 and in the recording studio through the 1960s, Gordon’s relationship with Elvis was one of mutual admiration. With Stoker’s death on March 31, 2013, the most reliable and respectful first-hand source about Elvis Presley’s musical career is now gone. 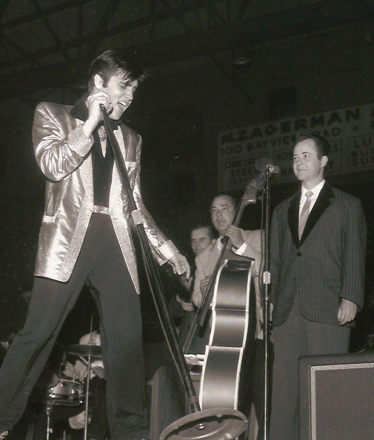 Gordon Stoker was the last surviving member of the Jordanaires who toured and recorded with Elvis in the fifties. (Hoyt Hawkins died on October 23, 1982; Neal Matthews on April 12, 2000; and Hugh Jarrett on May 31, 2008.) As his career was inseparable from Presley’s, the specifics of Stoker’s life are well known. Instead of repeating them, I’d like to honor Gordon by letting his voice be heard again. From 2003-2011, Gordon and I carried on an email correspondence. Most of it consisted of Gordon graciously answering a multitude of questions I asked him during the research for my Elvis ’57 book and later for my Elvis blog entries. What follows are excerpts from some of the many emails Gordon sent. When he seems to be jumping from one subject to another, it’s because he is answering a series of questions I asked him about working with Elvis in 1957. August 6, 2003: You are a brave one to take on writing about something that happened this long ago. You will be lucky to find anyone that was there that will remember anything about the dates. This also goes for me. The playing dates with EP were all pretty much alike with all the screaming girls. August 20, 2003: My son, Alan Stoker, has been with the Country Music Hall of Fame for many years. He restores old recordings, film, transcriptions, etc. Just wanted to say that since your name is Alan. Just got back from 12 days of tributes to Elvis. This being the 26th year he has been gone, fans just hang on to anyone that worked with him. We were so fortunate to have worked with him almost 15 years. When he went into Vegas, doing two shows a night (which I feel took his life), Scotty, DJ and The Jordanaires quit. We all had much work here in Nashville, but we hated to leave him. At first he did not understand because the Colonel told him a lie about it. Later we saw him and he seemed to understand. In 1957 we stayed in the same hotel as Elvis. The Colonel always made our reservations. Usually we would go up to his room after the shows. He would always be reading what reporters would write about him and the show. He was concerned, especially if it was not good. We would always tell him, “Don’t worry about that … so what?” But he didn’t want to read anything that was not good about us and himself. Hugh Jarrett was released from The Jordanaires in 1958 and replaced by Ray Walker. Hugh has never gotten over it, but we remain friends all these years. He lives in Atlanta. He just called, and I told him I was writing you and that you might call him. I did not have the photo you sent (right). I usually played piano and don’t know why Hoyt was playing that day [Seattle 1957]. We both played piano and/or organ on Elvis’s first recordings. Can you believe I played on Hound Dog? We signed the union card that paid the most money. The singer’s union paid more than the musician’s, and you couldn’t sign both. So Hoyt and I signed the singer’s card. Neal [Matthews] played guitar on several recordings. Because of this we do not get credit in many of the books. August 25, 2003: I do not know exactly how much we were paid. We were an established group, appearing on the Grand Ole Opry every Saturday night we were in town. The Colonel respected that, and we were paid whatever the going rate was for quartets. I know we were pleased with whatever we got, or we would not have appeared. Sorry to say, Bill, Scotty and DJ were not paid what they were to Elvis. He could not have appeared without them. This is the main reason Bill formed the Bill Black Combo, which had many hit records when El went into service. It’s also why Scotty is bitter about many things today, as I’m sure you know. DJ always makes the best out of everything. Elvis knew they were not happy, and could have done something about it, but he would not buck the Colonel. We had worked with the Colonel long before Elvis, with Eddy Arnold and others. He always seemed to like me, which really helped. He always came through with whatever we agreed on. Whatever he said he would do, he did. The main problem with the other guys was that they did not work out the deals before the dates. I’m thankful I had enough sense to do that even in those days. We still are getting paid for reruns of movies, TV shows, re-releases, etc. I have never asked Scotty if they were for fear of opening another can of worms! Trap door on stage? Seems I remember something like that. Elvis was always game for anything, and I mean anything. People make up stories all the time, but I certainly would not be surprised if this is true. The crowds were so unbelievable and hard to deal with. Elvis was really scared. When you talk about thousands screaming and pushing to break and run towards us, we were all scared. That was the reason he always stayed as close to us as possible. Being there and thinking back, it’s amazing someone didn’t get hurt or killed. He knew he could not play overseas because the security could not be as controlled as in the US. June 26, 2004: At present my wife and I are at our condo in Daytona. We’ll be here most of July. August is a big month and The Jordanaires have a lot planned. Hard to believe Elvis has been gone all these many years. Never a day passes that I don’t think of the many pleasurable things we did with him and the fun we had on either movie sets or recording studios with him. Have you heard some of the outtakes where he is laughing while recording? Seems like they happened yesterday. We are still working in studios doing background with various artists, but no one had the fun and excitement he had in the studio. And I think it comes through on his recordings. 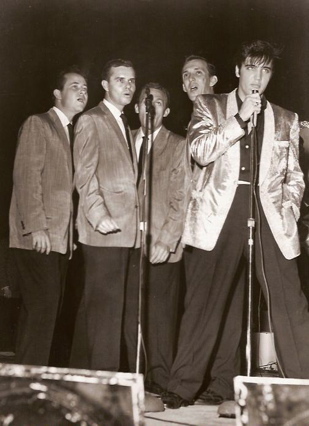 Bill, Scotty, DJ and the four Jordanaires were like a family with Elvis. He did not have brothers, so we were his brothers. Everyone loved each other like family. We all were very close-knit regardless of where we were with Elvis. He always had an excellent attitude and tried to make the best of everything whether it was picking material, or dealing with the movie officials, or the Colonel. So many times that was not easy. 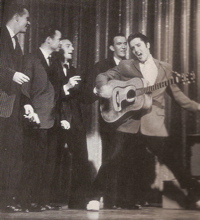 I think this is the reason his recordings are still around and selling so well today. They just don’t sound dated. Where else could you hear a 40-plus year-old record that did not sound that old. I did duets with him in 1957 and 1958. All Shook Up, my biggest with him, just does not sound that old. Am I right? January 29, 2007: I don’t know the name of the man with Elvis in the photo you sent. Since he is holding a folder in his hand, I would say he is someone the Colonel hired to take care of paperwork, etc., which he always had to do. Tom Diskin, who you see over his left shoulder, had more things to take care of than anyone should have had to. The guys around Elvis, “the gang” (you may call them something else), could not be depended upon for anything. Tom was a jewel, and Elvis liked him very much. August 9, 2007: Hey Alan, I just returned from Florida and found your book. Makes me feel good that you say the nice things you said not only in the book, but the note inside and your letter. Really appreciate that. I’m going to a BMI party tonight to kick off Joe Moscheo’s book, The Gospel Side of Elvis. So many have asked me, “You are on far more gospel recordings with Elvis than Joe. Why aren’t you writing?” But I’m sure you will tell me it takes a lot of time, which I don’t feel I have. Minnie Pearl wrote a book, and she said, “Honey, if you don’t have the time to travel and promote, it won’t sell.” What are your thoughts? November 4, 2009: A lot has gone on in my ‘old age’ corner. I had double pneumonia in May of this year, and I’m not over it yet. I am diabetic, so that makes it double hard to get over. Doctor said it would take me months, and it has for sure. As for Crying in the Chapel, we recorded it about 3 a.m. after we had been singing since 6 or 7 o’clock in Studio B here in Nashville. Elvis said, “Let’s do Crying in the Chapel.” Of course, the song was pretty much of a hit already, so we all had heard it on the radio. We were tired, but I’m thankful we don’t sound tired. I have never liked our ending. Of course, in those days you couldn’t repair it. All of us knew we sang the wrong parts, but Elvis said, “It’s good. Forget it. It doesn’t make any difference.” It always has WITH ME. Ernst Jorgensen had me write the liner notes for EP’s new all religious songs CD, I Believe. Do you have that? September 13, 2010: Thanks for remembering my birthday. I’m trying to forget! Wish they wouldn’t print my age in papers across the country. I feel we got to work with him in the good years. I’m so sorry things didn’t turn out for him like he wanted them too, and I certainly can say it was not all his fault. He was tooooo easy and sweet to get along with. Everyone took advantage.